A couple of weeks ago friends took me into the countryside of Kent to find bluebells. This picture is for them. Thanks was a super day. Fresheyes eyes will be out of action for a couple of days. So preposted pictures will appear. Mo, I think this is your best picture yet. I hope you are going to enter it into the Countryfile competition this year ? 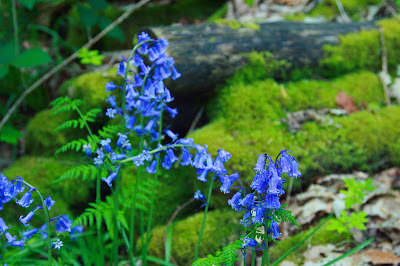 What perfect blue colour against the vivid green - even the log looks blue ! Is it possible to take a bad picture of a bluebell !!! So beautiful! I bet the rest of the countryside was great as well. Ciao. A. What a corker photo - your friends feel very privileged! Amazing colour!! They couldn't be called anything else except 'blue bells' (the latin name is Endymion non-scriptus). I remember picking them as a child, the stalks full sticky sap & bells wilting before putting in the jam jar. Thanks Mo, another great photo. This reminds me of my Kentish childhood - carpets of blue among the fresh green of the trees and velvety moss and the uncurling fronds of bracken. Gorgeous! Oh I definitely love this one. I get so jealous of everyone who gets to see bluebells! This is an absolutely beautiful picture,good job! I adore bluebells, who doesn't? Bluebells are a beautiful sign of spring and nothing finer than a beautiful image like this. Kent known as the "Garden of England" and some days I see why. Such gorgeous colors! You couldn't have wished for a lovelier scene. I really love blue. It was a super day and this is a super pic! We'll miss you next couple of days! Beautiful. I like the contrast with the green moss in the background. Such a pretty photo - brilliant colors! The moss in the background is very pretty too. You always have great photos.